Anyone is welcome to go out with one of our teams as an observer, to see what we do and how we do it. To arrange this, please get in contact with Mark, our coordinator, via our contact us page. After a short meeting, you will be invited out as an observer on patrol before being invited to make a formal application. There is some paperwork that will need to be completed and all applicants need to undergo an enhanced DBS check. happy to work in a team, and fill in paperwork to record the duty. 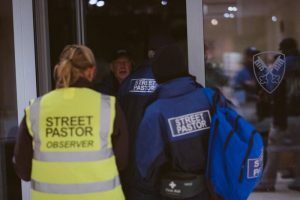 Prayer Pastors do not undergo the same level of training that Street Pastors do, but they do need to meet with our coordinator. If you would like to know more, or are interested in applying, get in contact with our coordinator, Mark. His details are on the contact us page.